An example of how this woman’s one-page profile has helped open up good conversations with her respite team so that they can support her well whilst away from her home. Seventy-seven year old Dorothy comes to stay at the respite centre twice a year while her daughter has a break from her role as a full time carer. Dorothy has some very specific health needs and has asthma, heart problems, a hearing impairment and schizophrenia. At just eighteen Dorothy got engaged to her husband who she sadly lost at a very young age and never remarried. Instead she concentrated on bringing up her children. She worked all her life from the age of fifteen up to her retirement. While the children were in school Dorothy worked jobs around school time, as they got older Dorothy worked longer hours as an machinist. Life was hard at times. Whilst at respite we wanted to get to know Dorothy well, find out more about her so we could support her in the things she liked to do. Dorothy would often sit quietly alone and we hoped that by creating a one-page profile with her it might open up some positive conversations. It did! Dorothy was very chatty about the holidays she enjoyed with her husband and children, Italy Payton and Margate. She also talked about her love of reading, she particularly likes the friendship book that is out at Christmas, she says it gives a lot of information about things that have happened over the years. Dorothy also loves doing puzzles especially word searches. Of her time with us, she said that she enjoys her stays but is always happy to go home to her family. We created a one-page profile that communicated all the rich information we now knew about what was important to Dorothy and how best we could support her. Dorothy is a very independent lady who likes her privacy and takes pride in her appearance, always immaculately dressed and turned out. Supporting her to look and feel her best is crucial to her wellbeing and so this is reflected on her one-page profile. All staff are now much clearer about what works and what doesn’t work for Dorothy and her time with us is much more enjoyable for her as a result. An inspirational example of how one-page profiles can help people in hospital connect with others during confusing and difficult times. Kris had no idea of the impact her mum’s one-page profile would have, not just for them, but for the medical staff, other patients and their loved ones. Meet my mother, Laurine Kaiser. She has been married to my father for soon to be 63 years. They have three children, myself (Kris) being the middle child in addition to my older brother Stephen and my younger sister Kimberly. Mom was born in 1927 and will be celebrating her 86th birthday in November this year. She has always enjoyed an active life as a Mom, wife, travel companion, pharmacist, bridge player, friend and sister to a younger sister and brother who live in Kitchener. My Mom and Dad moved in to my home in 2010 shortly after my husband passed away. We spent a few months together before my Mom fell ill for the first time in her life. She ended up at St. Joseph’s hospital in Hamilton where she remained a patient for five months. The doctors had quite a challenge for some time trying to figure out exactly what was wrong with her. She eventually ended up in the Intensive Care Unit (ICU) and spent almost two weeks there before she graduated to the Progressive Care Unit. At that time my Mom was not able to use words and was extremely tired from the long journey she’d been on in the ICU. On several occasions nurses, doctors, therapists etc. would enter the room and ask me questions about my Mom…did she ever work, what line of work, is she married, how many grandchildren etc. That was when I decided to create a one-page profile for my Mom. Looking at this frail yet dignified and elegant woman lying there so peacefully yet so helpless I knew that I needed to do something so that people could connect with my Mom by looking and reading her profile. It was a way to humanize my Mom and value her as a person with a story to tell and not just someone lying in bed 2B. I was excited to complete this one-page profile for her, knowing that this would make a positive difference in her life. I created the profile in one night with a dollar store bristle board, a black magic marker and a few photos of her along with the joys in her life. When I returned to the hospital the next day I couldn’t wait to put it up! My Mom was thrilled with it and stared at it for hours. She would smile and point to people making kind gestures. The nurse came in the room that afternoon and read the board and quickly pointed out that my Mom’s favourite TV show was Big Bang Theory which was also hers. She remarked, “I’ll put it on the TV for her tonight at 7:30. Mom gave her the biggest smile. Word seemed to get around the floor and the hospital about my Mom’s one-page profile and soon other patients’ families and friends on the floor were asking to see it, vowing to create one for their loved one. It just seemed to snowball with positive remarks from all. Close to the end of my Mom’s extended stay at St. Joseph’s the administration team came to have a look at the profile and said that they should introduce this in their hospital. That was a great day!! 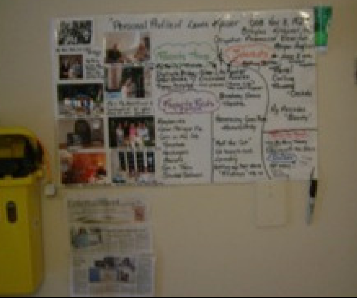 Doing the one-page profile for my Mom made such a difference in her mental and physical recovery. Having this tool created a way for others to have a conversation with Mom and it also provided information about her interests and hobbies which often was a source of some great chats with people she met at St. Joe’s. I’ve always known that the one-page profile works however I didn’t know the impact it would have on so many people and their loved ones. A powerful reminder of how what might seem like a small gesture can significantly improve a person’s happiness and wellbeing. Mary was brought to tears when her support team introduced her to the home pet, after stating how important animals were to her in her one-page profile. Mary is 75 years old and has dementia. She was living in a care home and we were asked to see if Mary could move to Beaconview. When we assessed Mary she was laying on her bed with the bed rails up. Mary is registered blind and has had some paranoid experiences. The staff from the home where we saw her said that ‘she liked to spend time in her bedroom’. Mary was very quiet and appeared to be quite isolated. During our assessment, we asked Mary what her hobbies were and what her preferences were for a variety of things. We also asked her if she really did like to spend all her time in her bedroom, her answer to this was that she liked to spend some time alone. Mary also told us that she loved animals. From this conversation we were able to create a one-page profile for Mary before she came to Beaconview. Once Mary’s one-page profile was completed the care staff were able to read it and had an understanding of what her needs and preferences were, whilst also having a clear understanding of what was important to her. Mary’s experience in moving to her new home was enhanced by the fact that staff were able to have conversations that were more pleasant and personal to her as a result. Because of this all the staff at Beaconview were able to begin to build a trusting and meaningful relationship with Mary from the very moment she moved in. We had recently bought a bunny for Beaconview and because the care staff knew from her one-page profile that Mary liked animals they decided to take the bunny to Mary so that she could enjoy its comforts. Mary’s face lit up when she was informed that the bunny was here to see her, we asked her to put her hands out so that she could feel it. Mary was so pleased that we had ‘thought about her’ and the things she liked that she began to cry. Mary then cuddled the bunny and kept talking to him. Mary never did spend all day in her bedroom after that as she had something to focus her attention on. She felt a great sense of wellbeing each day. Mary kept thanking the staff for what they did and although it seemed a small gesture on their part it really made a difference to her life. The care staff were also extremely pleased that they were able to bring her so much happiness. Having a one-page profile makes a massive difference to a person’s wellbeing, as it helps to build and form good relationships and it makes staff realise from a snap shot what is most important to a person. The one-page profile is easy to read and easy to understand. This skill is very useful to all other professionals also. Before we had one-page profiles it was difficult for all the staff to understand what was important to that particular person. The profiles ensure that not only is the person supported in a way that makes sense to them but that what matters to them is also included in their support. The important bit is to act upon the individual preferences outlined in a one-page profile; truly keeping the person at the heart of all support. A powerful example of how one-page profiles can help people living with dementia share what is important to them and how best to support them. Kenny wasn’t using speech to communicate anymore and his mobility had suffered after a fall. His family and support team needed to share what they knew about Kenny and his history with each other to help him communicate better and have more choice and control. The company of his wife and mother, chocolate, magazines, newspapers, tea with two sugars and long bubble baths; these are the things that are important to Kenny. The people who support Kenny know this straight away even if it’s the first time they have met him. How? Because it is written on his one-page profile. Kenny is 64-years-old and is one of the warmest people you could wish to meet. He has lived in a home which supports people with dementia for five years. Kenny was a very confident man who could go and chat with a roomful of strangers easily. He enjoyed socialising with friends, and a drink in his local most days on his way home from work. As Kenny’s illness progressed it became clear to those close to Kenny that he was bored and restless. Kenny no longer used any words to speak and was unable to move around unless supported by two staff members or in a wheelchair due to a fall which led to a broken hip a year previously. A person-centred review meeting was arranged with Kenny, his wife Jean, his mum Ethel. I was the facilitator and we brought in the support staff who knew him best, including Adrian the nurse who had specialised in dementia care. Prior to the review, they carried out a functional assessment to establish a broad brush view of the stage of dementia Kenny was at, which at best could be helpful in creating activity which would increase Kenny’s well-being and ensure he had the things that mattered to him present in his life. At least it would give those close to him ideas to try in order to learn what worked well for Kenny. At Kenny’s review meeting, everyone gathered their collective learning about what was important to him, what best support looked like from his perspective, any questions to answer or issues to resolve; and what was Working and Not Working from the perspective of Kenny, his family and the staff team. This was a process which helped everyone think about Kenny’ life with him. Its purpose was to inform action that made life better for Kenny and his allies. Those who knew Kenny well recognised what he was saying with his behaviours and so they began to record that rich information onto communication charts. This would be added to by everyone who spent time with Kenny as they learnt new information. They also explored how they could provide opportunities for Kenny to try new things to help them learn more about what would make life better for him. The most significant outcome from the meeting was the development of Kenny’s one-page profile which would prove invaluable to staff as they used it as their job description (how best to support Kenny) on a day to day basis. It meant that even new staff could get to know Kenny quickly and support him in ways that made sense to him. Having the things that were important to Kenny written down on one sheet of paper made a massive difference. Knowing the important people in his life, how he takes his tea, what treats he likes, what calms him down and what works him up enabled the team to support Kenny well. As well as capturing this vital information, the great in-depth conversations that occurred between Kenny’s family and support workers when creating the one-page profile meant that they were able to share history and personal knowledge that could be used by each other to help Kenny feel more in touch with his past and reconnect with familiar times. Life is much more interesting for Kenny these days – evidenced by the spark in his eyes and frequent smile on his face – a rarity before staff explored these approaches with him. His support worker Jane described it as a “transformation…’’ and it isn’t just Kenny’s life that changed so positively. The people who care about Kenny now have the confidence that people understand him well and appreciate him for his personal talents and gifts. You can use conversation cards to ask good questions that draw out rich information, when supporting someone with dementia and their family to create a one-page profile.